The culmination and the highest most inclusive level of love between the Lord and His devotees is manifested in Vrindavan. Lord Krishna descends from Goloka Vrindavan to this material world once in a day of Brahma. When He told about His plan, to come to this world, Radharani said, “I cannot live without You and I want to come with You.” Sita was willing to leave Ayodhya to go into the forest for fourteen years to be with Rama and Srimati Radharani was willing to come to the material world, filled with so many envious, demoniac people, to be with Krishna. 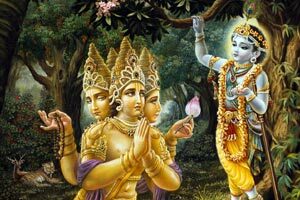 Lord Krishna said, “We will go together,” and He also sent the forest of Vrindavan, Govardhan Hill and Yamuna. Hera Panchami – The nature of Vrindavan is revealed in the Caitanya Caritamrita. In Jagannath Puri, Caitanya Mahaprabhu was celebrating the Hera Panchami festival. In this festival Lord Jagannath leaves the Jagannath Temple, which represents Dwaraka and Kurukshetra to go to Gundica, which represents Vrindavan. Lord Caitanya requested Swarupa Damodar Goswami to describe the sweet rasas of Vrindavan. Hearing this, Srivas Thakur smiled and began to compare the opulence of Vaikuntha with that of Vrindavan. Srivas Thakur said that Vrindavan is simply a forest with some plants and trees and the gopis there are simply milking the cows, whereas my goddess of fortune is sitting on a magnificent golden throne decorated with jewels in Vaikuntha. Swarupa Damodar Goswami then explained that the Lord manifests His six opulences in completeness only in Vrindavan. Compared to this unlimited ocean, the Lord’s opulence in Dwaraka is simply a tiny drop of water. In Vrindavan a single grain of dust is cintamani, the trees are kalpavriksha and the unlimited cows are allkamadhenu cows. Hearing this description of Vrindavan, Sri Caitanya Mahaprabhu began to dance and He became so much uncontrolled in ecstasy that He manifested the form of Sri Radha. Finally upon the request of Swarupa Damodar Goswami, Lord Caitanya stopped dancing and came back to external consciousness. Lakshmiji denied Entrance – Across the river Yamuna is Belvan; a place where Lakshmi Devi who came from Vaikuntha to participate in the Rasalila was denied entrance. She performed tapasya for ten thousand years in Belvan and Krishna manifested His beautiful three fold bending form. Still she was not allowed to participate in Rasalila, because she saw the Lord as her master and conceived herself as the all–opulent goddess of fortune. To participate in the Rasa lila meant assuming the role of a gopi, which meant simply milking cows, churning butter and carrying cow dung on the head. In this way this pastime revealed the supremacy of Sri Braja bhumi. 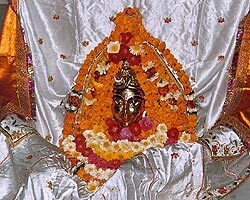 Gopeshwar Mahadev – Lord Shiva also wanted to renounce everything to take on the mood of a gopi. Through his supreme wisdom, yogic vision and his ultimate knowledge he understood that there is no higher spiritual experience of love than that of the gopis. He was told, “If you want to enter the Rasalila you must take the female form of a gopi.” He then took his bath in Mansarovar, which is filled with the tears Srimati Radharani’s love. When Shiva took his bath he came out with the bhava and the form of a gopi. He was given the service of being the guardian of the Rasalila in the form of Gopeshwar Mahadev. Lord Brahma – During the Brahma Vimohana Lila when Lord Brahma saw little Krishna with a stick looking for His calves, with a lump of yogurt and rice in His hand, Brahma surrendered his heart and soul. He understood that there is no higher abode than Vrindavan and there is no deeper love than what is within Vrindavan. Brahma wanted to leave his post to take the form of a little mountain so that all the gopis, gopas, cows, peacocks along with Radha and Krishna would put the dust of their feet on his head. That is how precious Vrindavan is. Uddhava – Uddhava, who was the closest and dearest associates of Lord Krishna in Dwaraka prayed and did tapasya to leave his high post and be a blade of grass or a tiny creeper growing in the land of Vrindavan. He understood that in order for him to actually taste the sweetness of the love of the Vrajvasis, he had to take the most menial position of a servant, to be under the feet of the residents of Vrindavan.